J Harlen Bretz is best known for his hypothesis that floods of enormous volumes once swept across southeastern Washington and on out the Columbia River Gorge to the Pacific Ocean. Bretz was widely criticized by his contemporaries for his "outrageous hypothesis" while continuing to use his own observations, not popular opinion, to develop his ideas. Like a detective, Bretz gathered as many clues as he could and reached what he believed to be the best solution to the geologic puzzle of the Missoula Floods. Born in Michigan in 1882, Bretz showed an early interest in science, and in college obtained a biology degree. While teaching high school biology in Seattle, Washington, he became interested in glacial landforms in the Puget Sound area that were formed during the most recent glacial period (ending about 10,000 years ago). He spent many of his weekends in the field taking careful notes about the landforms that he saw. Many of his observations were published in scientific journals. In 1913, Bretz earned a Ph.D. in geology at the University of Chicago and began studying landforms in eastern Washington state that seemed to defy explanation by traditional geologic theories. These landforms included incredibly high dry falls perched well above the current river level; huge potholes, some 50 to 100 meters (150 to 330 feet) across; huge 200-ton boulders, that because they differed markedly in mineralogy from the surrounding bedrock must somehow have been transported to their current locations; and gigantic gravel bars that were the size of hills, hundreds of meters long and tens of meters high. Bretz's experience in the glacial terrain of the Puget Sound offered him an important perspective. He recognized many of these features were simply gigantic replicas of the same smaller-scale features that he had seen time and time again in glacial streams and outwash areas: the depositional and erosional products of meltwaterfed streams during the last ice age . Clearly, however, the volume of floodwater required to produce these gigantic landforms would have had to have been prodigious. The prevailing theory regarding the origin of Earth's landscape was Uniformitarianism, which stated that all landforms on Earth's surface were produced by ordinary geologic processes—for example, stream erosion and deposition—acting over immense geologic time. These processes were deemed capable of producing deep canyons such as the Grand Canyon of the southwestern United States. The contrasting theory, Catastrophism, held that landforms on the Earth resulted from catastrophic events, such as huge earthquakes and biblical floods. To many geologists in 1920, Bretz's flood hypothesis was too close to a biblical interpretation. Bretz endured nearly four decades of doubt and ridicule by other geologists of the time, in part because Bretz was unable to offer a reasonable explanation for the source of the huge amounts of water that would have had to have been suddenly and catastrophically released across eastern Oregon. Bretz's work was finally vindicated, however, when another geologist, Joseph Pardee, found evidence of a former huge lake (Lake Missoula) in western Montana that was formed when the Clark Fork River had been dammed by a glacier. The lake had rapidly drained when the dam failed, allowing enormous amounts of water to flood eastern Washington (see discussion below). J Harlen Bretz was the first to piece together the geological history of the Missoula Floods. 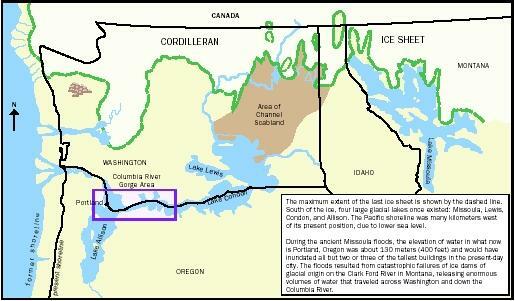 This figure shows the maximum extent of the last ice sheet in what is today the U.S. Northwest, as well as the four ancient glacial lakes: Missoula, Lewis, Condon, and Allison. Scabland is an area of basalt flows that was flooded. Note that the Pacific shoreline was many miles west of its present position, due to lowered sea level. Geological Society of America awarded J Harlen Bretz, then 96 years old, the Penrose Medal, the highest national geological award for his contributions to geological knowledge. Enormous gravel bars, 90 to 120 meters (300 to 400 feet) high. Lake Missoula was formed by the glacial damming of the Clark Fork River at the end of the last ice age (approximately 10,000 years ago). Ancient lake beaches perched on mountains 640 meters (2,100 feet) above the present-day valley floor indicate the lake's size. When the dam failed, Lake Missoula waters roared out at the phenomenal rate of approximately 40 cubic kilometers (9.5 cubic miles) per hour, almost 200 times the Mississippi River's flow rate at flood stage. The rapid draining is indicated by huge ripple marks, 15 meters (50 feet) high and 150 meters (500 feet) apart, on today's valley floor. The damming and flooding cycle repeated itself as many as 40 times during the last ice age. SEE ALSO Glaciers and Ice Sheets ; Ice Ages ; Stream Erosion and Landscape Development . Allen, John Elliot, Marjorie Burns, and Samuel C. Sargent. Cataclysms on the Columbia. Portland, OR: Timber Press, 1986. Mueller, Marge, and Ted Mueller. Fire, Faults & Floods. Moscow, ID: University of Idaho Press, 1997.